Tomsk is a city and the administrative center of Tomsk Oblast, Russia, located on the Tom River. It is founded in 1604. 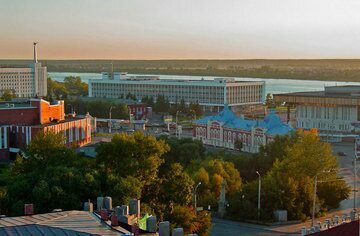 It is a large educational, scientific and innovative center of Siberia. There are 9 universities and 15 research institutes. Tomsk has a humid continental climate. The annual average temperature is 0.6 °C. Winters are severe and lengthy, and the lowest recorded temperature was -55 °C in January 1931. However, the average temperature in January is between -21 °C and -13 °C. The average temperature in July is 18.1 °C. The total yearly rainfall is 435 mm. The average wind speed is 1,4 meters per second.